According to a new crime report published last week by the FBI, the Drug War is still a pervasive cause for arrest in the United States. The data, which covers recorded arrests for violent crime and property crime as disclosed by local police departments, revealed that arrests for simple possession of drugs — mostly marijuana — are still widespread across the country. According to the FBI’s Uniform Crime Reporting Program report, titled “2015 Crime in the United States,” there were 1,488,707 total arrests for “drug abuse,” a category that includes the sale, trafficking, and possession of drugs. Compared to arrests for other specific categories of offenses, drug violations were the most common. Of 10,797,088 total recorded arrests in the United States in 2015, drug abuse arrests were the highest (1,488,707), followed closely by property crimes, which accounted for 1,463,213 arrests. Drunk driving arrests came in third, with 1,089,171. By comparison, there were just 11,092 arrests for murder and nonnegligent manslaughter, though “other assaults” did account for 1,081,019 arrests, the fourth most common. Some proponents of the Drug War might rationalize nearly 1.5 million drug arrests as an effective effort to stop traffickers and drug dealers. 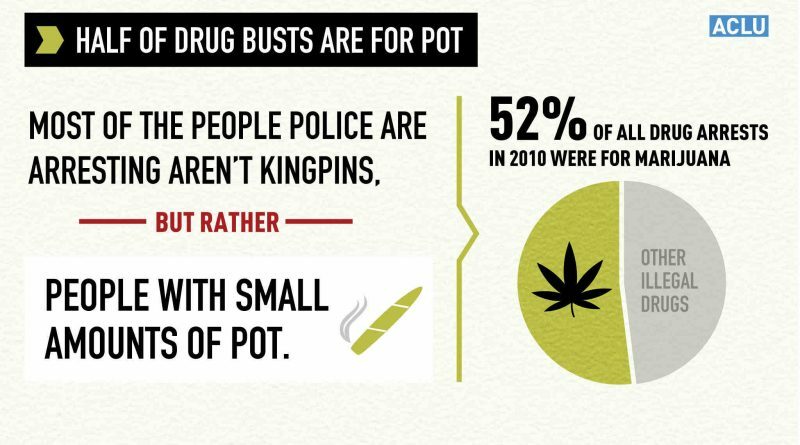 But arrests for the sale or manufacture of drugs accounted for just 16.1% of all drug arrests, roughly 239,682. Arrests for mere possession totaled 83.9% of drug-related offenses — 1,249,025. Possession of marijuana accounted for 38.6% of all drug abuse arrests (574,641) while 19.9% were for heroin or cocaine and their derivatives (296,252). Possession of “other dangerous nonnarcotic drugs” prompted 20.2% of “drug abuse” arrests, and possession of synthetic or manufactured drugs made up for 5.1% of arrests. 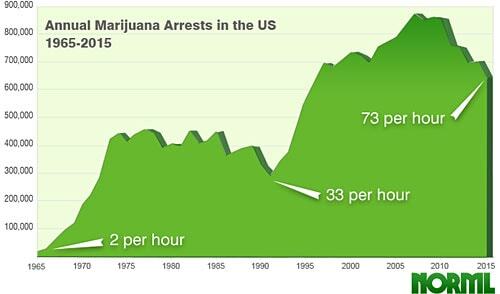 Though, as the Washington Post points out, arrest rates for marijuana are the lowest they’ve been since 1996, there were over 1,500 arrests per day in 2015 — simply for possessing marijuana. In the Northeast, Midwest, and South, marijuana possession arrests were responsible for roughly 50% of all drug arrests (in the South, that figure was 50.7%). In the West, where many states have embraced cannabis use, arrests for possession of the plant accounted for just 16.5% of all drug arrests. The effect of the drug war is evident not just in arrest figures, but in data documenting incarceration rates in the United States. According to the Bureau of Prisons, 46.4% of inmates (83,982) were behind bars for drug offenses, making up a substantial chunk of the population. To be fair, the Bureau of Justice has asserted almost all federal drug offenders were convicted of trafficking, and in state-level facilities, drug offenders made up roughly 17% of inmates. 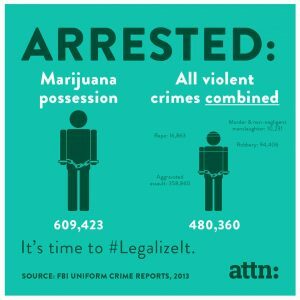 Regardless, it remains that on a daily basis, hundreds – if not thousands — of Americans are harassed by law enforcement for simply possessing a plant (or another substance). Further, it is unsurprising that, at least among prison populations, drug trafficking is a common offense. 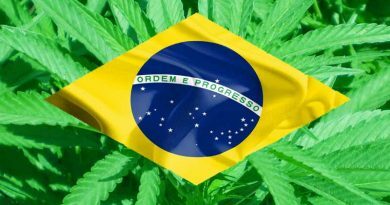 When drugs are prohibited, as alcohol prohibition proved in the 1920s, black markets undoubtedly develop, meaning ultimately, the government’s own tirade against drugs is at least, in part, responsible for the growth of the narcotics market and, as a result, traffickers. 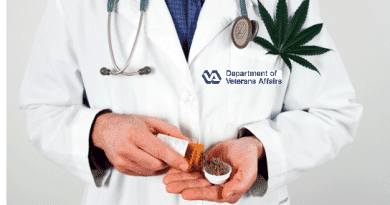 More fundamental, however, is the question of whether or not the government should be allowed to regulate what substances nonviolent individuals choose to put in their bodies, and by extension, who sells them those substances. As some police officers opt to make cannabis a lower priority – and even to take a compassionate approach toward heroin addicts in the face of the nation’s pharmaceutical opioid crisis — the country’s overall crime data appears increasingly archaic. © 2016 Antimedia.org. Original Article here. Re-published under creative commons license.